What does this day really mean? I know people treat it like it's the day the gates of Hell opens up. I'm one of those weird people who likes this day because of its horror association. My only experience with Friday the 13th involves a machete wielding masked man...zombie...demon who likes to chop up stupid people doing dirty deeds. Why is it, in slasher flicks, the only smart/entertaining people are the ones doing the killing? For all you teenagers and college students wanting to go out tonight to the middle of nowhere for some debauchery, I'd suggest you wait until tomorrow. Please stay away from lakes, old campgrounds and a house where a child named Jason Voorhees grew up. You know I had to do that. So, what does Friday the 13th mean? People have a lot of theories. I was surprised. I had expected a clear cut answer, but people really don't know when this superstition started. The fear of Friday the 13th is called “paraskevidekatriaphobia,” a word derived from the Greek words Paraskeví(Friday) anddekatreís(thirteen), attached tophobia(fear). 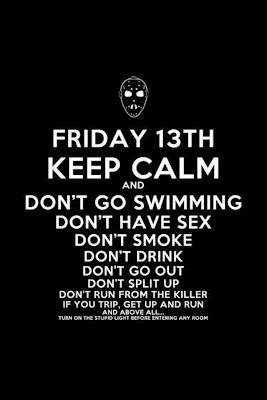 According to the Stress Management Center and Phobia Institute in Asheville, North Carolina, fear of Friday the 13th affects between 17 and 21 million Americans. “Paraskevidekatriaphobia” seriously!? What normal person can pronounce this? One theory states that that thirteen is an unlucky number and that Friday is an unlucky day. In numerology, the number twelve is considered the number of completeness, as reflected in the twelve months of the year, twelve signs of the zodiac, twelve hours of the clock, twelve tribes of Israel, twelve apostles of Jesus, twelve gods of Olympus, etc., whereas the number thirteen was considered irregular, transgressing this completeness. There is also a superstition derive from the Last Supper that having thirteen people seated at a table will result in the death of one of the diner guests since Jesus was arrested and crucified after the Passover meal He shared with His twelve disciples. Friday was the day on which Eve offered Adam the forbidden fruit and Jesus was crucified. 12 gods were having a dinner party at Valhalla, their heaven. An uninvited 13th guest, the mischievous Loki, walked in. Once there, Loki arranged for Hoder, the blind god of darkness, to shoot Balder the Beautiful, the god of joy and gladness, with a mistletoe-tipped arrow. "Balder died and the whole Earth got dark. The whole Earth mourned. It was a bad, unlucky day." From that moment on, the number 13 has been considered ominous and foreboding. Another popular theory links the superstition to the demise of the Knights Templar, a monastic military order whose members were arrested by France’s King Philip IV on Friday, October 13, 1307. After employing torture techniques to compel the Templars to "confess" to wrongdoing, most were eventually executed and sympathizers of the Templars condemned Friday the 13th as an evil day. In ancient Rome, witches reportedly gathered in groups of 12. The 13th was believed to be the devil. Also, Friday was execution day. In 1880, The Thirteenth Club was formed to test superstitions surrounding Friday the 13th. They met on the thirteenth day of the month and would have 13 people sit at a dining table in room 13. Guest were often required to walk under ladders and break mirrors. The club eventually grew to have over 400 members. Other Thirteenth Clubs were formed across the US. Though nothing unusual or ghastly happened to its members, Friday the 13th is still seen as an unlucky day. Since I'm a dark fantasy writer and I love world building I have to point out, all these lovely details outlined above are awesome fodder for coming up with history and myths in your fantasy world. GotQuestion: "What is the meaning of Friday the 13th?" Loki would just have to do that too. Here, any Friday the 13th that doesn't fall in the winter, there's a town in southern Ontario where bikers converge each time. It's a festive occasion, no trouble or anything, just a day to go riding, and the town rakes in a good deal of money through the day. Well, I lived through yet another Friday the 13th! For me, it's no big deal. Matter of fact, the very first Friday the 13th 3D movie came out when I had to sneak into the theater to see it. Mwahahahahah!